Places now available on week long singing holiday in Kinsale, County Cork, Republic of Ireland. See Future Events for more information. Sing Your Socks off for Sing for Water West, Sunday 10th July 2016 in Bath. Ali Orbaum and Wendy Sergeant are running a series of 6 singing workshops in June to prepare singers to take part in the Big Sing in the Park in front of Bath's iconic Royal Crescent on 10th July. Be part of a massed choir of 1000 singers and raise awareness and funds for WaterAid. Sessions start on Tuesday 7th June at Glenfrome Primary School in Eastville. Click here for more info. 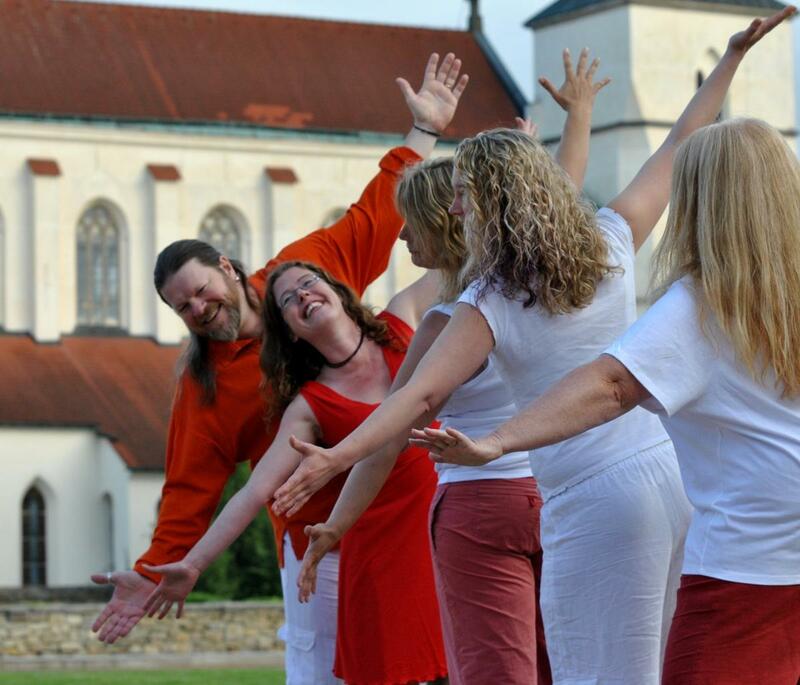 The Sing Your Socks Off team are highly experienced singing workshop leaders and run fabulous singing holidays in gorgeous harmony. The core group of teachers are Dee Jarlett, Ali Orbaum, Chris Samuel, Fran Bolton and Elaine Wilson and sometimes they invite other colleagues to teach with them. All were members and workshop leaders in the acclaimed a cappella group Naked Voices, a 15-piece group which won 3 Sell-out Show awards at the Edinburgh Fringe and entertained audiences at Arts Centres and theatres all over the UK. The Sing Your Socks Off team offer various singing holiday packages of day, half day, weekend or week long harmony singing workshops. These can lead to performances by the participants, and can also include a performance by the teachers' own a cappella quintet The Barefooters. 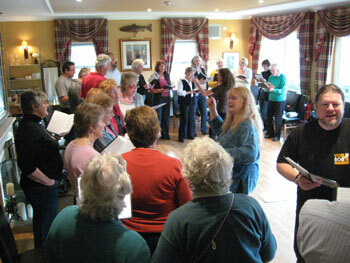 On our singing holidays we have great fun combining singing workshops with all kinds of other activities. For example, singing holidays, afternoons of walking or swimming and "barefoot picnics". Everyone is welcome, whether you have sung before or not. We believe that everyone can sing and encourage beginners to join our workshops as well as those who are more expert and experienced. No music reading is required as everything is taught by ear. It's amazing how quickly a big bunch of people can sing in harmony when they are supported by these experienced teachers. You will be uplifted and have a lot of fun! Dee and Ali have been working together since 1995. They founded Naked Voices and Bristol's huge Gasworks Choir together. Although Dee retired in 2013, Ali is still a Director and the choir will soon be 20 years old (click here for more info). Dee runs the off-shoot choir Gasworks Singers and Classical Gas. They also used to sing and teach together as members of the 4 piece female a cappella group Sweet Soul Sisters. Chris runs three community choirs jointly known as the Wiltshire Wailers as well as The Magnificent AK47 - the singing blokes of Ashton Keynes. He performs with The Spooky Men's Chorale and The Croutons (click here for more info on his groups, workshops and performances). Fran runs three community choirs, two of which are all-female choirs called Stepford Singers and Frenchay Foxes, both based in Bristol. The other is The Caring Chorus, which is based in Gloucester and is made up of NHS Gloucester staff and members of Gloucester Cathedral's community. 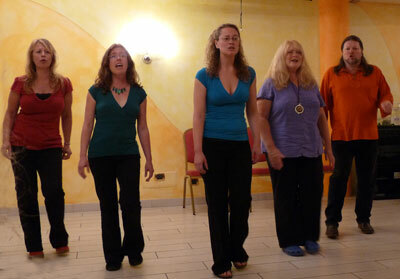 The team have also run Sing For Water events in Bristol since 2006, and several singing holidays together in Austria and Italy, France, Scotland, Wales and England. They are popular for the ease and speed with which they get people singing in harmony, and for their light-hearted, accessible and friendly approach. Elaine runs Riff Raff, Bristol's leading a cappella pop and rock choir, which claims to be the most fun you can have with your clothes on! Riff Raff will also be performing in Colston Hall in Riff Raff's Grand Night Out on Sunday 24th July in their biggest concert to date, which promises to be a night to remember. The concert will also raise money for Wallace & Gromit's Grand Appeal. So the next time you're planning a concert, or looking for something fun and fresh to do with the singers in your choir, how about considering a Sing Your Socks Off event? A workshop in the afternoon to learn a couple of gorgeous new songs, followed by a chance to perform them, plus a set from your own repertoire at an evening concert, supported by the Barefooters quintet. Our Barefooters performance set has been going down a storm and includes uplifting fun and funky a cappella songs from Britney to Elgar. We could be the support act for your choir, or you could sit back and let us entertain you.